I had never played Rogue Trooper before this review. I just loosely knew it as “that shooter with the blue man in it” and sometimes confused it for an Army Man game because I don’t know, 2000AD properties and Army Men kinda blend together in my head for some insane reason. I like PS2 era shooters, however, and while many of them have not aged well, the idea of taking one of the later generation ones and trying to make it more… modern, is definitely appealing to me. 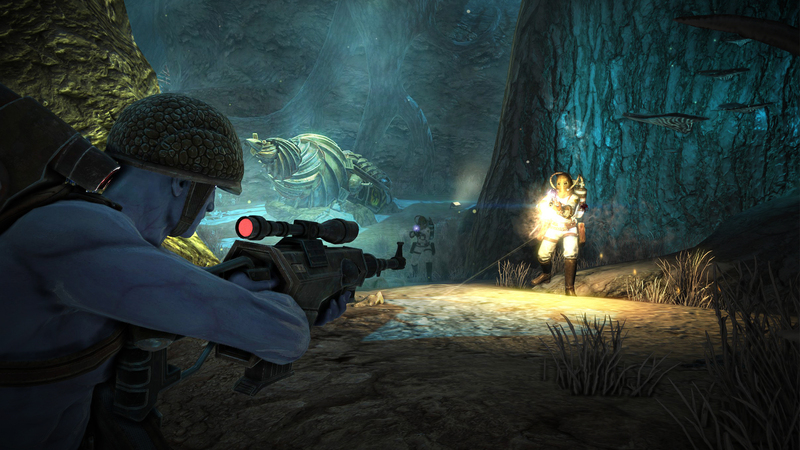 This Redux release of Rogue Trooper boasts a graphical overhaul of the game, propelling it from the basic limited power of the PS2 to the HD prowess of modern consoles. On the Switch, this means the models have been redone and look pretty detailed and generally good. The textures have also been redone, and there are some new post processing effects like some nice blur effects and such. Think of it as a half step between an HD Remaster of a game and a full remake like the recent Ratchet & Clank or Crash Bandicoot revivals. A lot of work has been put into making Rogue Trooper look better than before but it’s still miles off looking like it was made for this generation of consoles. It looks fine, but it looks dated. The textures and models themselves largely look good, and it runs at a decent clip, but lets just say you aren’t buying this game for the graphics. Well, except maybe the skybox, I’d excuse you for buying this game just to look at the weird swirling vortex in the skybox of this game. It’s gorgeous. 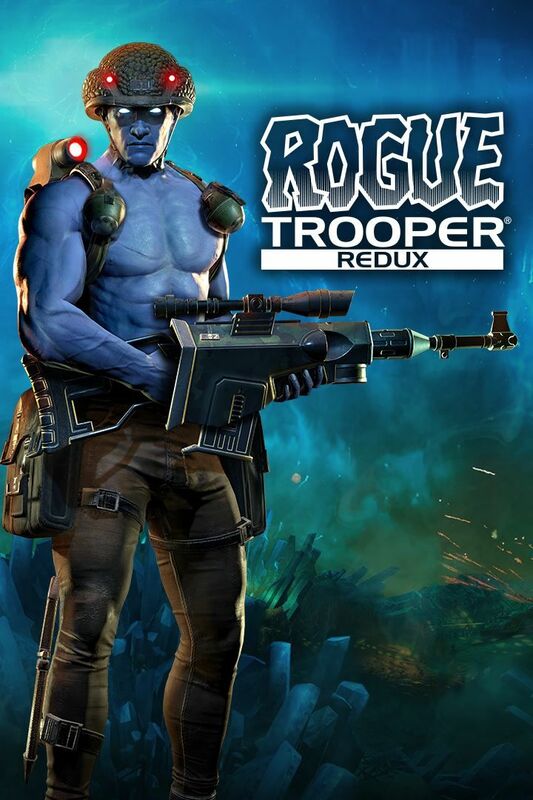 So why would you buy Rogue Trooper? Well, it’s a pretty damn good third person shooter in its own right. 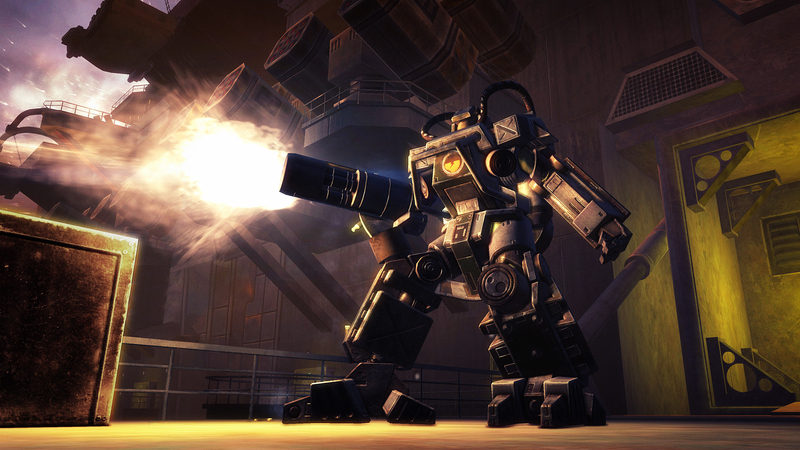 It follows a Genetic Infantry Trooper by the name of Rogue (get it, Rogue Trooper? That’s some 2000AD humour for you right there) whose squad are all ambushed and killed and he uh…goes Rogue to get revenge. It’s a simple premise which is good enough to get the action flowing but isn’t exactly gripping. Dishing out your revenge, however, is. To start with, Rogue only has access to an assault rifle, a pistol and some grenades making the game feel like a pretty standard third person shooter. As his journey progresses he unlocks new abilities and weapons which open up more ways to approach each enemy encounter. Want to equip a silencer, sneak up on enemies snapping necks or shooting them quietly? That’s completely valid for most of the game, even encouraged in some levels. Prefer going loud? Your assault rifle or Shotgun will do the trick. Area open enough that you can see enemies from far? Pop out a holographic version of yourself and let the enemies waste rounds on it while you pick them off one by one with a sniper rifle. It’s a great set of tools which gives you enough to play around with to find your own style. It’s also not very difficult on the default setting, so there’s no real “wrong” thing to do. You’re always going to win. Worth also throwing in here that Rogue Trooper totally has a cover system in it. This game came out before Gears of War popularised them too! It’s up there with Kill/Switch in the “did cover systems before Gears of War” pantheon. That said, it’s a really really bad one. In this Redux they opted to go for the “modern” approach to cover systems. Like The Last of Us and Tomb Raider where you go in and out of cover by moving into it rather than pressing a button to snap to it like in Gears of War. The issue is it’s incredibly unresponsive. I found myself often failing to snap into cover until I had tried a couple of times (and soaked up a few bullets for my troubles), failing to snap into cover at all when there was clearly something I should be able to hide behind and less frequently, accidentally snapping to cover when I didn’t want to and being stuck there for a couple of seconds until the game realised I was trying to get out of cover. It’s just bad. But thankfully you don’t really need to interact with it at all. The good thing about the game giving you so many options on how to play is that you can just not play in cover. Ever. And I highly recommend that. As you progress through the rather short campaign, more of Rogue’s allies will die and he’ll harvest microchips from their bodies, which contain their personalities, and implant them into his gear. Your gun, backpack and helmet all end up with personalities of their own and some abilities to go with this new-found sentience. Your gun gains some generous aim assist. I’m talking, aim vaguely in the direction of the enemy and spray to kill everything kind of generous. Your backpack lets you craft more ammunition and upgrades using scrap which you can salvage from bodies of enemies. My personal favourite is the Helmet which unlocks upgrades for your minimap but more importantly lets you make holograms of yourself which can walk around and distract enemies. Your helmet also gains the ability to hack computers when it is upgraded, resulting in multiple sections where Rogue sets his helmet down on a computer panel like some kind of oversized Amiibo to hack into them. It’s pretty great. Most of the humour and writing is fun in Rogue Trooper. There’s an okay amount of silly banter and quips between Rogue and his haunted hat, gun and bag, but not enough of it. A lot of the time Rogue Trooper feels like it actually takes itself a bit too seriously. Its tale feels like at times it’s trying to tell a serious story and just happens to have the bizarrely insane premise of “two factions were fighting each other and one side made an army of blue clones to do their fighting for them.” As a result it often just feels… boring. There’s nothing super interesting about any facet of the story or writing in this game, and it’s a bit of a shame. I’ve never read the comic it is based on, but generally 2000AD comics are good at balancing their silly and overly serious tones. But this game does not. I feel like there’s a lot to like about Rogue Trooper Redux on the Switch, but it’s also one that shouldn’t be a high priority purchase. The campaign is only maybe 4 or so hours long and while there’s unlockable cheat modes and difficulties to pad that out a bit more, it’s still just not a lot of game. There are also some co-op modes, mainly a survival mode which is a basic Horde mode, and a kind of mission based mode where you’re mostly trying to get from point A to B with lots of enemies attacking. Both of these modes are playable online and with friends. You don’t even need Nintendo’s garbage online app on your phone to set up games. It’s like it’s 2006 again or something. 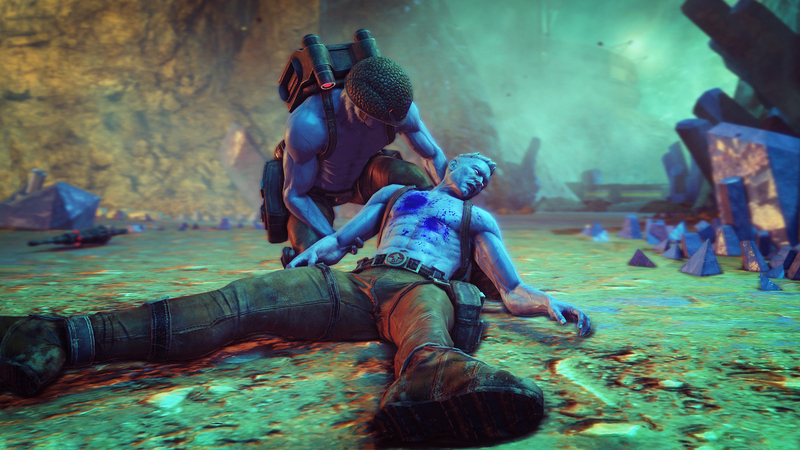 Rogue Trooper has perhaps not aged perfectly and this Redux version perhaps does not go far enough into modernising it to make it reach the standards of a current gen shooter. Maybe it’s a bit short. Maybe its story is a bit boring, but you know what? 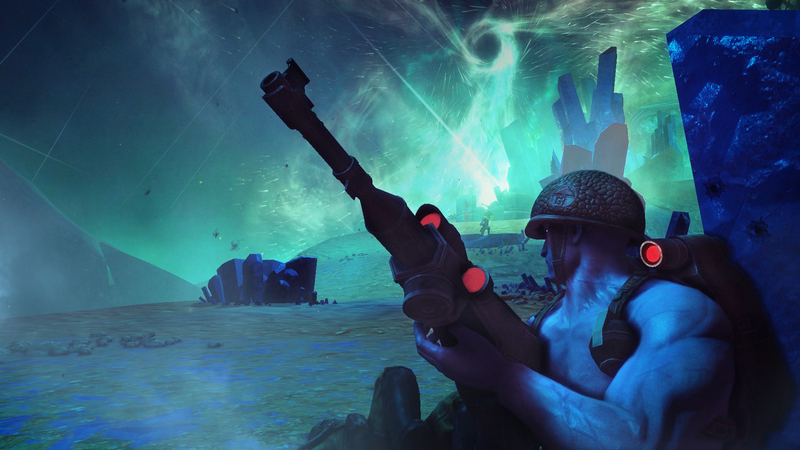 I enjoyed my time with Rogue Trooper Redux on the Switch and you’ll probably enjoy your time with it too. It’s not going to win any awards or anything, but not all games need to. Sometimes you need something that’s just good.